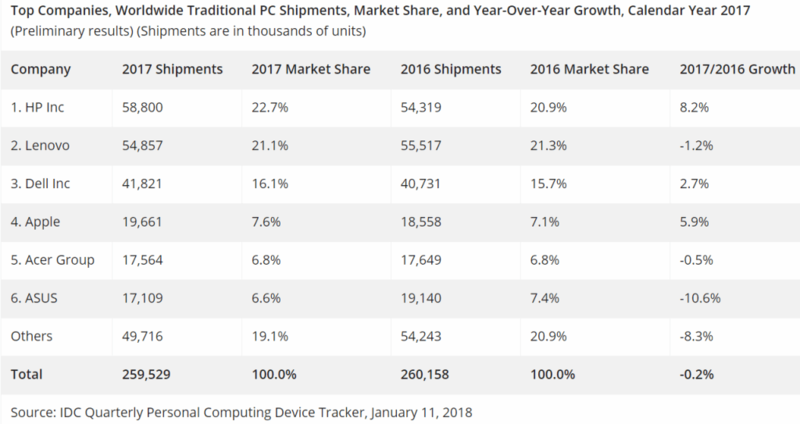 The last few years have brought seemingly constant news of the PC industry’s decline, but at least one market research firm has recorded that 2017 saw the most stable PC market since 2011. 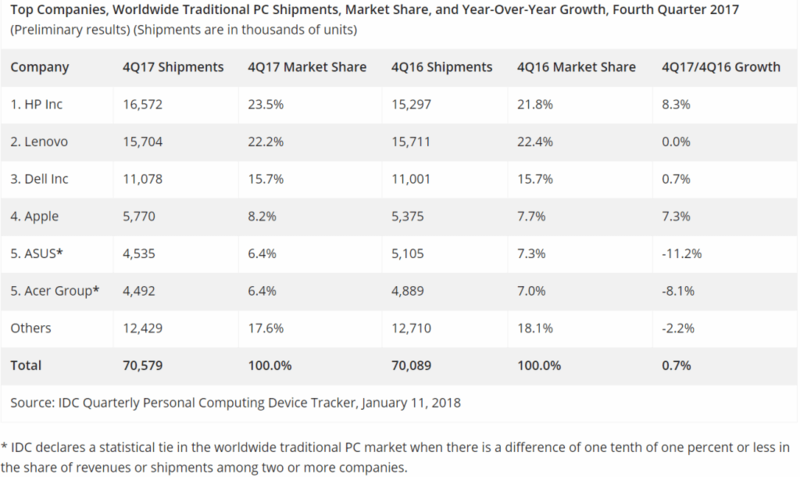 IDC had predicted that PC manufacturers would see a 1.7 percent shipment decline during the Q4 period last year, but almost 70.6 million units were shipped—0.7 percent more than the fourth quarter of 2016. This is the first time shipments have rose over the holiday season in six years. There was also a 0.6 percent gain in the previous quarter, though the market did decline 3 percent in Q2 2017. IDC did note that overall growth for 2017 was down, but only by 0.2 percent. It warns that while the fourth quarter was reason for encouragement, there’s still a way to go before things turn around. Demand continued to increase in Europe and the Middle East during Q4, but the US market performed below expectations during the quarter as mobile devices continued to dampen many consumers’ enthusiasm for new PCs. "The fourth quarter results showed some potentially encouraging headway against the difficult environment in retail and consumer PCs," Jay Chou, research manager with IDC's Personal Computing Device Tracker, said in a statement. "Enticed by a growing array of products that promise all-day battery life, high portability, and address emerging use cases that require more compute power, pockets of the consumer base are taking a serious look at these revamped PCs. 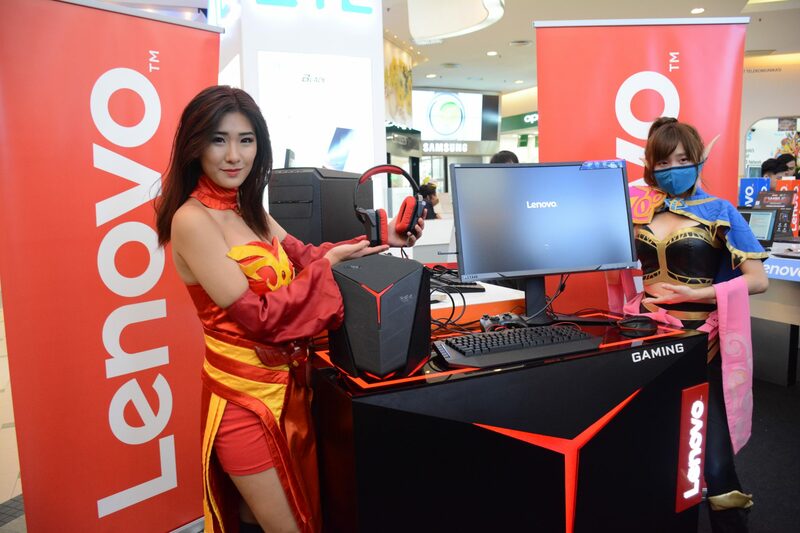 However, the overall PC market remains a challenging one." A separate report from market research firm Gartner paints a more pessimistic picture. 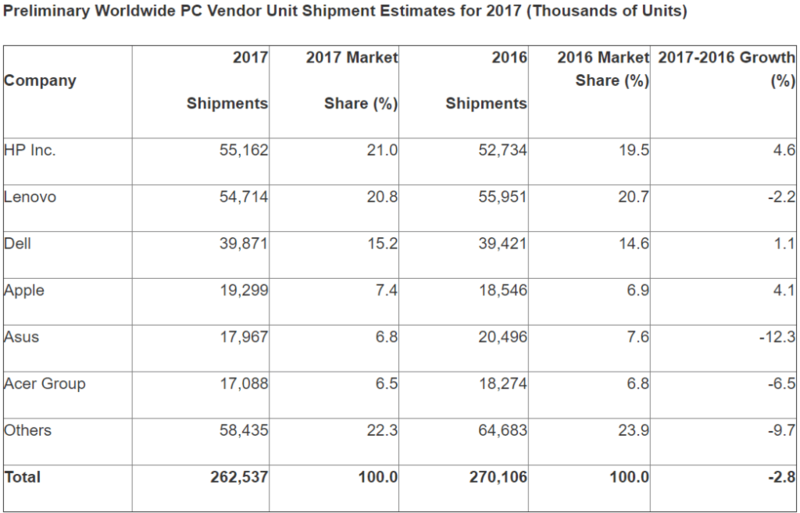 It states that the worldwide PC market fell 2 percent in Q4 2017, making it the 13th successive quarter in a row that shipments have declined. For the entirety of 2017, it puts the decrease at 2.8 percent. This marks the sixth year in a row that the market has fallen, according to Gartner. 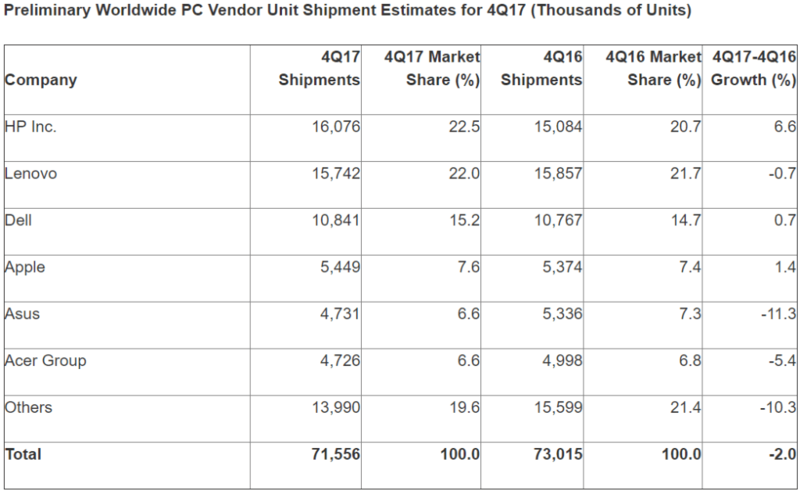 What the companies do agree on is the top four worldwide PC vendors in 2017. It would have been all six, but Gartner thinks Asus beat Acer out of the fifth spot. The firm puts overall shipments at 262,537, while IDC puts it at 259,529. Something I can report, here in the UK at least, Getting hold of HP ProBook G5's was impossible for the last couple of months. HP even gave up 10% back on our order for taking so long. Their reason was they had higher than expected sales over the Christmas season and were struggling for stock. Various entities have been saying that PCs are becoming extinct for a long time now. However, I view reports like this with skepticism since we may not see that there is another entity funding it that has a direct interest in seeing whatever is being reported on die. Even with stuff like "eink" displays, you just can't compete with physically going threw a stack of papers. I was never able to put my finger on why but it just always seemed easier to go threw a stack of papers than a PDF or something. Even when I get a PDF I usually print it out. Who's the biggest loosers? ASUS, Acer & Lenovo. Traditional manufacturers of "private" PCs - entertainment and gaming machines. People notice they have no incentive to upgrade for their 'general purpose' PCs. Manufacturers traditionally associated with workstations/office machines are up front, but slightly. Companies will unwillingly but still, buy PCs if they need to. Price fixing of CPUs (Intel, till Ryzen), GPUs (limiting output at the moment of maximum mining craze), RAM, NAND and other industry's sins are taking its toll, in the form of general public's perception that the industry is just trying to milk us all, not giving anything meaningfull back, I would say. They are complaing but revenues per PC sold must be through the roof, compared to previous decade of healthy, yet tiring, competition. We have not bought any new machines for 2 years now as our last purchases of Win10 machines has been a dismal failure. We had to return them to Win7 to be usable. It's the additional information your brain picks up when using physical paper. The feel, the sounds, the smell. PDFs don't provide any of this and it hurts their usability. It's all part of the user experience. Software has low hardware requirements. Low and mid range CPU's and GPU's are more than enough for ~75% of consumers. Memory density is more useful than higher frequencies. We've peaked. The only thing worth upgrading is storage, displays and graphics for most of us. That's pretty much it. I'm trying to make excuses to upgrade from my 2500K, but I just can't. Not while running a very good 1080p monitor. And a jump to 1440 would require a new GPU and monitor at the very least, and even then I'd know my CPU would be holding me back, which would require a complete platform upgrade. I need a reason to upgrade. The only growth I see is related to prices, look at GPU and RAM now. lol. The only reason to upgrade my main rig right now is for the newer features of the motherboards as my processor is holding it's own and my video card is a fairly new upgrade. My SSD has been upgraded recently also. Yes I would like the faster NVMe SSDs but it's not necessary and only something I want. Thought I would be on a new rig by Christmas 2017 but the price of ram is seriously holding me back. I can bet I am not the only one. I had my new system completely picked out and most of it in my cart until I came to which ram was compatible with my motherboard and.... just said no. My current computer still runs everything I am running and generally runs it well even if it is old. I figure if the components last, I will try to wait out the current DDR crisis until prices come back from neverneverland and the collusion (if they ever do). PC's are not becoming extinct, there are several reasons for OEM slow sales 1- they charge 2 much for what they are giving, this isn't entirely their fault but market inflation like SSD and GPU hike increases due to industrial means and several markets converging. 2- people are either building their own, or having someone build for them. 3- for gaming for about 12 years all they had to do was upgrade GPUs as CPUs and core package upgrades aren't worth the update costs. 3- people are content with what they currently have. It's because our touch is our proofing ability. It's the sense we use to tell if something physically proves to be what is stated as such in the physical world. You can't just change evolution in 50 years. Well That's like E-Readers while Ideal for reducing clutter and baggage, there is just something tangible about a physical hard cover copy of a book from the texture and feel to the smell of the pages paper to the leather or interesting bindings. Also in most cases Why should anyone pay for a Digital Product that is even remotely the price of a physical one, that is just a rip off. "$19.99 Own the digital copy only available for streaming on Amazon"..............35$ at best buy gets me the Steelbook version with extras and such...and I own it.